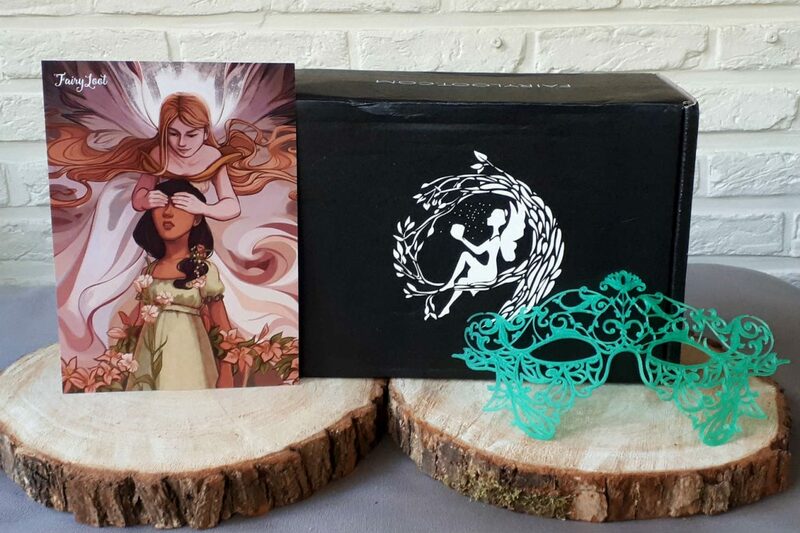 Yay, the 7th day of the month has come (and gone), so I can finally talk about last month’s Fairyloot box! And let me tell you, this was a hard one to stay quiet about for so long. 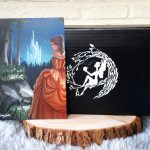 So without further ado, let’s have a look at all the goodies we got in this Fairyloot October 2018 box! The theme for the October box was “Beautiful deceptions”. As usual, the spoiler card came with gorgeous art on the back (which you can see in the big image at the top of this post), and as usual, it’s created by Taratjah. I’ll let you admire this print for a while. Ready to move on? 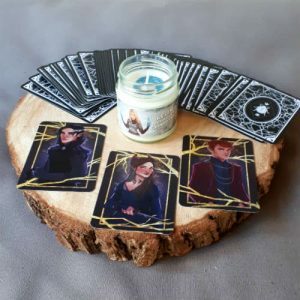 Okay, let’s start with this Aelin candle by Nerd Poured Candles. Aelin is the main character of the Throne of Glass series, of which the final book (Kingdom of Ash) was released a few weeks ago. The candle itself has the default white-ish colour, but there are blue glitters on top. And the scent, you ask? It’s lemon verbena and fire. It sounds like a strange combination, but the fire is very subtle and the result smells great! Next up we have a deck of playing cards inspired by The Cruel Prince. These gorgeous cards feature art by Emily Haynes in collaboration with FictionTeaDesigns. I love these designs, especially Jude as the queen, with her horned hairstyle and dagger! I don’t often use playing cards, but I can’t wait to use this deck. 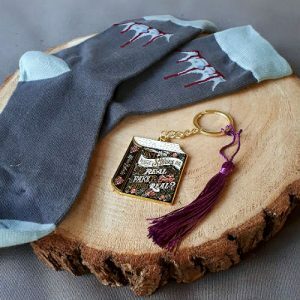 The next item is a keychain inspired by The Winner’s Curse. It’s designed by KDP Letters and it’s absolutely stunning! The book cover features the quote “Isn’t that what stories do, make real things fake and fake things real?”, and there is also the purple cord and tassle. The keychain is on the big side (which I’m generally not too fond of, to be honest, but this one is too beautiful not to use), so you’ll never have to dig through your bag for your keys! Now that winter is coming, the next item will be super useful: a pair of socks! They are inspired by Red Queen and feature the crown dripping with blood that we know from the cover of the book. I’m not too crazy about the grey-brown colour, but these socks will still come in handy the next few months! And for even colder days, there’s also this gorgeous beanie! 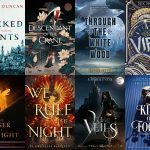 It’s designed by FictionTeaDesigns and is inspired by Six of Crows. It features a crow (of course) and the quote “no mourners, no funerals”. I might get funny looks when people read that, but I’ll still be wearing this beanie all the time! The next item is also perfect for cold days. And hot days. Seriously, tea is always perfect, right? This tea is created by The Tea Leaf Company and is a blend of peppermint green tea. 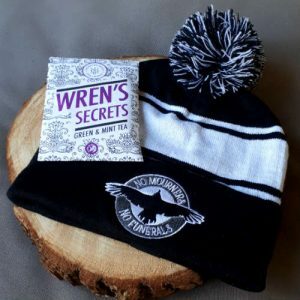 Its name Wren’s Secrets comes from the book of the month, which features a character named Wren (and she has quite a few secrets!). I’ll have to hide this bag, because my boyfriend loves mint tea and I’m afraid he’ll drink this behind my back! As always, there’s some extra swag as well. 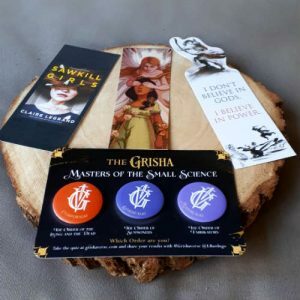 We have three pins inspired by the orders of the Grisha (from the Grisha trilogy and Six of Crows). 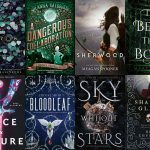 There’s also a link to grishaverse.com, where you can take a test to get “sorted” into the right order. I’m an Alkemi, by the way, so I’ll be wearing the purple pin! 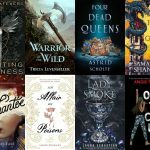 And now, the big moment you’ve all been waiting for… the featured book! 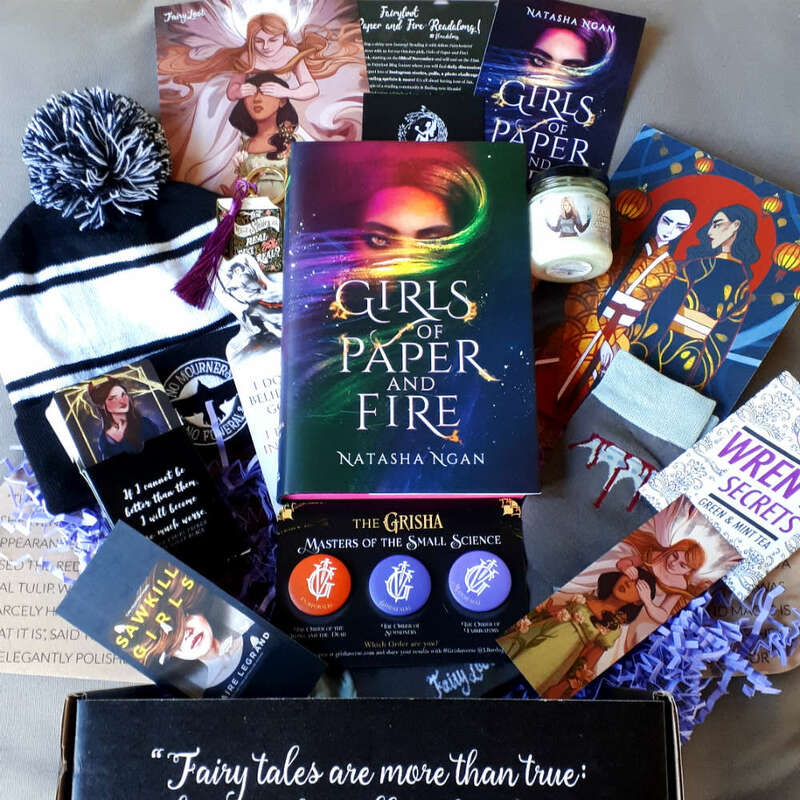 It’s… *drumroll*… Girls of Paper and Fire by Natasha Ngan! First of all, let’s take a moment to admire how pretty it is! I love the colours in the girl’s hair and how it blends with the dark background. Also, this is an exclusive edition with pink sprayed edges and it’s signed by the author! So what is it about, you ask? 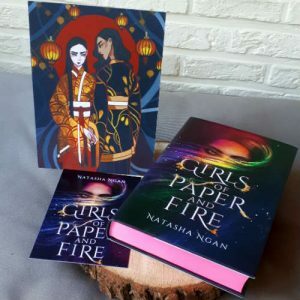 Girls of Paper and Fire tells the story of Lei, who is part of the lowest caste in society, and who is taken to the palace to become a concubine for the demon king. But Lei doesn’t want to just accept her new life and fights back. I was looking forward to this book so hard! I’ve already finished this book and let me tell you, it is amazing! You can expect a review soon, once I manage to form coherent thoughts about this story! 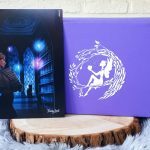 Bonus swag: a letter from the author with character art on the back and a postcard with the cover artwork, an invitation for a Fairyloot readalong, the newsletter and the buddyread hashtag. 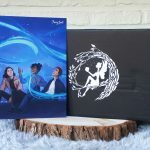 There you go, that was everything that came in the Fairyloot October 2018 box. What is your favourite item? Let me know in the comments below!